Stay up to date on the latest renewable energy news from Bullfrog Power! 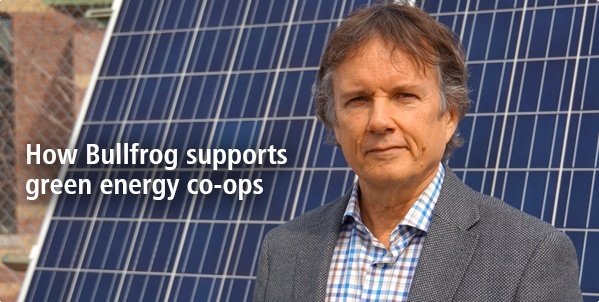 Mike Brigham is the President and Co-Founder of SolarShare, a renewable energy co-operative that develops solar power projects in Ontario. SolarShare currently has more than 1,300 members and 38 projects across the province. Brigham tells the story of how he began with a single off-grid cottage, and the importance of SolarShare's partnership with Bullfrog. Read Mike Brigham's story. What do you get for the mom who has everything? This Mother's Day, give the gift of green power for one year. With this gift, we ensure the energy going onto the grid for your mom's computer is coming from clean, green sources like wind and water. All year, your mom can enjoy her favourite sites and shows, knowing the computer's energy has less of an impact on the environment. She'll receive a personalized digital certificate representing the green power you’ve purchased on her behalf. You'll both feel great knowing you’re creating a cleaner, healthier world. Click here to get started. Congratulations to bullfrogpowered Pete's Fine Foods, which recently celebrated its 25th anniversary in Halifax. Festivities included live music, tastings and samples, a farm-to-table-style brunch as well as a reunion of Pete's founder Pete Luckett and journalist Nancy Regan (above). The pair originally partnered in a popular CTV Live at 5 segment on unique fruits and vegetables. Here's to another 25 years! For this year’s Earth Hour, Bullfrog Power and Ivanhoé Cambridge teamed up to provide enough renewable energy to bullfrogpower every home in eight Canadian cities—each home to an Ivanhoé Cambridge shopping centre—for one hour. Together, we bullfrogpowered the equivalent of more than 1.9 million households across Canada during Earth Hour. More than 50 members of the bullfrogpowered community came out to celebrate Earth Hour at Reunion Island Coffee Bar in Toronto’s Roncesvalles neighbourhood. Refreshments were provided courtesy of bullfrogpowered businesses such as Granville Island Brewing, Jayne’s Gourmet and Lindt Canada. Finally, thanks to Reunion Island, who provided delicious coffee along with the intimate locale! Would you know a cleantech worker if you saw one? As Bullfrog partner Clean Energy Canada explains in its latest blog post, cleantech employees aren't just hardware technicians—they're accountants, lawyers and engineers as well. Canadian cleantech companies employ more Canadians than the forestry, pharmaceutical or medical device industries, so we may need to broaden our perception of who exactly works in the industry. Read on to learn more. In B.C., Hyatt Regency Vancouver, which bullfrogpowers its meeting spaces and Hyatt Nature Hike, hosted its annual Happy Earth Hour event, featuring a nature-themed menu and bringing together several members of the bullfrogpowered community. Thanks to BCSEA, Ethical Bean Coffee, Pacific Gateway Hotel, SES Consulting and Terramera for joining us in the celebration. Bullfrog is sponsoring and exhibiting at this year's Fair Trade Show in Toronto from May 13 to 14, and we're offering you a complimentary ticket to attend. The Fair Trade Show connects ethical businesses to consumers who believe in the power their purchases have to shape the world around them. To claim your ticket, visit this page and enter the code visitus. Hope to see you there! DCR Systems Group, a newly bullfrogpowered IT services company in Richmond Hill, Ontario, stresses the importance of sustainably and ethically phasing out businesses' old computer equipment. DCR ensures that clients' old computer equipment doesn’t end up in landfills or exported offshore to be disposed in another country—learn more. You received this email because you are subscribed to eBuzz from Bullfrog Power Inc..